Loretta Lynch’s brilliant speech against hate crimes is a stinging rebuke to Trumpism. Attorney General Loretta Lynch, Nov. 2, 2016. Attorney General Loretta Lynch delivered a speech Monday at the All Dulles Area Muslim Society Center, a mosque in northern Virginia. The Justice Department described her address as an affirmation of the agency’s “commitment to combatting hate crimes” in light of the recent spike in bias-motivated violence. But Lynch’s speech was much more than that: It was a passionate, deeply moving, surprisingly sharp rebuke of Trumpism—delivered without a single mention of the president-elect’s name. This morning, we have gathered under this roof, in this mosque, as men and women of all races, creeds and colors. Some of us were born in the United States, our immigration status having been resolved several generations ago; some of us came here more recently in search of a better life. We may speak different languages; we may read from different books of scripture; we may call our God by different names. But we all love this country and the ideals for which it stands. We all want our children to lead lives of safety and opportunity. We all proudly claim the title of American. … In this assembly, I see a living expression of the American promise: the conviction that every person’s dignity is inherent and equal. 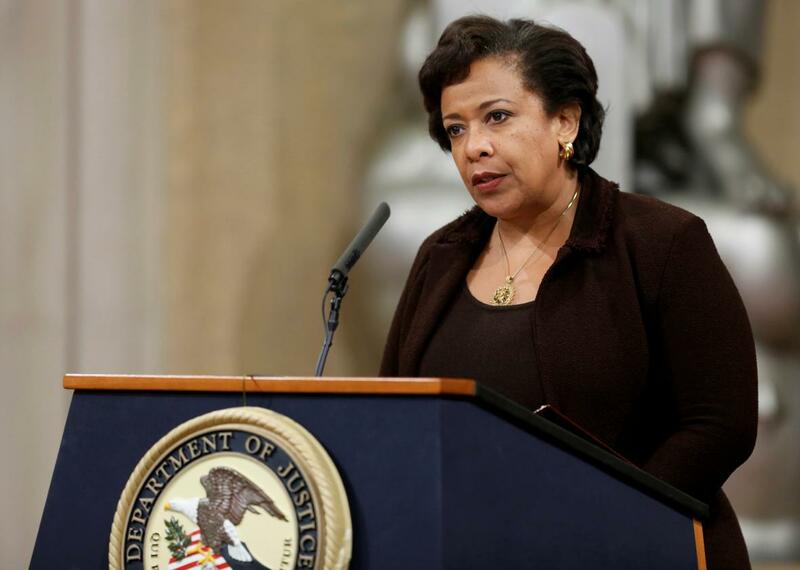 “That promise,” Lynch continued, “is as old as our nation itself. Twelve score years ago, our forefathers boldly proclaimed that ‘all men are created equal.’ ” Lynch then acknowledged a fact that has lately become anathema to conservatives: Many of our Founding Fathers were hypocrites, exalting liberty while enslaving humans. Of course, when those words were written, a large gap existed between America’s founding ideals and America’s founding reality. The very hand that put those words on parchment had also signed the deeds for the sale and purchase of other human beings. For many of our ancestors—for women, African Americans, Native Americans, immigrants and countless others—the promise of American life rang hollow. Generation after generation of Americans heard the promise set forth in the Declaration of Independence and the Constitution, and they demanded that it be fulfilled: women who endured ridicule and condescension for seeking the ballot; black soldiers who defended freedom overseas, only to return home to a nation that wouldn’t let them vote, and that sometimes repaid their service with angry violence; marchers who braved the jaws of police dogs at Birmingham, and the sting of cattle prods at Selma; LGBTQ individuals who fought for their civil rights at the Stonewall Inn—through the courage and determination of these and countless others who have gone before us, we have slowly built a society that more fully reflects our founding creed of liberty and justice for all. In addition, all of us have seen the flurry of recent news reports about alleged hate crimes and harassment—from hijabs yanked off of women’s heads; to swastikas sprayed on the sides of synagogues; to slurs and epithets hurled in classrooms. Muslim Americans are our friends and family members, our doctors and nurses, our police officers and firefighters. They own businesses and teach in classrooms. Thousands of them have fought for the American flag. Many have died defending it. And yet, too often—especially in the last year, following a number of tragic terrorist incidents, and amidst an increase in divisive and fearful rhetoric—we have seen Muslim Americans targeted and demonized simply because of their faith. And to impose a blanket stereotype on all members of any faith because of the actions of those who pervert that faith is to go backwards in our thinking and our discourse, and to repudiate the founding ideals of this country. We are also concerned with crimes against our LGBT brothers and sisters. In October, we commemorated the seventh anniversary of the Matthew Shepard and James Byrd Jr. Hate Crimes Prevention Act, which expanded the federal definition of hate crimes to included crimes based on gender, disability, gender identity, and sexual orientation. Here, too, we have been active, bringing hate crimes cases in a number of states around the country. Tomorrow, I am traveling to New York to meet with LGBT youth, and to reaffirm the department’s steadfast commitment to the rights and well-being of all LGBTQ Americans. I am encouraged by what we have accomplished together over the last eight years. But I also know that we face many challenges in the years ahead—challenges that will require the Department of Justice to remain an active force for good in communities from coast to coast. Our federal hate crimes laws are among the most powerful tools we have for creating a more just and equal nation, and career Justice Department prosecutors will continue to enforce them. I understand those feelings. I know that as we continue to demand a nation where all people are truly treated equally, we will be met with prejudice, bigotry and condemnation. It is true that there is nothing foreordained about our march towards a more just and peaceful future. There never has been. Our centuries-long project of creating a more perfect union was not the product of fate, or destiny. It was the result of countless individuals making the choice to stand up, to demand recognition, to refuse to rest until they knew that their children were inheriting a nation that was more tolerant, more inclusive and more equal. That is why it is so fitting that we are here today in this beautiful house of worship, this place of deep and abiding faith. It has been faith that has sustained this fight since the beginning. Faith—a small band of colonies could separate from the most powerful nation on earth and chart a course of freedom and equality. Faith—a new nation and its ideas could survive a bloody and divisive civil war that arose from its original sin of slavery. And not just faith—the works that made it so when there was no guarantee of success. My friends, that hope is still alive in our country. You and I know what the declaration means when it says, “All men are created equal.” You and I know what the Constitution means when it says, “We, the people.” So let us leave here united in our confidence, inspired by our faith and strengthened by our courage. Let us leave here with a renewed commitment to demanding nothing less than a country that is true to its founding promises. And let us leave here in hope—the hope that has brought the United States so far in the last 240 years; the hope that I am confident will carry us even further in the days to come. Will this work be hard? It has always been hard. Will we persevere? We always do. In a little over a month, Lynch will be gone from the Justice Department. But her words on Monday will remain a source of strength for tolerant Americans through the Trump era and beyond. Much like her famous transgender rights speech, Lynch’s mosque address felt instantly historic, a declaration of courageous opposition to bigotry in an political atmosphere that rewards prejudice and provincialism. Her address was quietly stunning and startlingly bold, an impassioned defense of those minorities being actively targeted by the incoming administration. Lynch did not mention Trump’s name or quote his sadistic rhetoric. She didn’t have to. In a single speech, Lynch rebuked the entire philosophy of Trump and Trumpism—and presented an alternative path forward, one rooted in equality, justice, and our shared humanity.